← GADPA 2011 Georgia State IDPA Championship Full! What separates Homo sapiens or modern humans from the rest of the animal kingdom is our ability to reason and use tools. You may think that many humans lack the ability to use reason, but, at the bare minimum, most everyone can use tools. One tool I do not leave home without is my pocket knife. Recently, I discovered the SOG Specialty Knives Vulcan Mini and could not be more impressed. 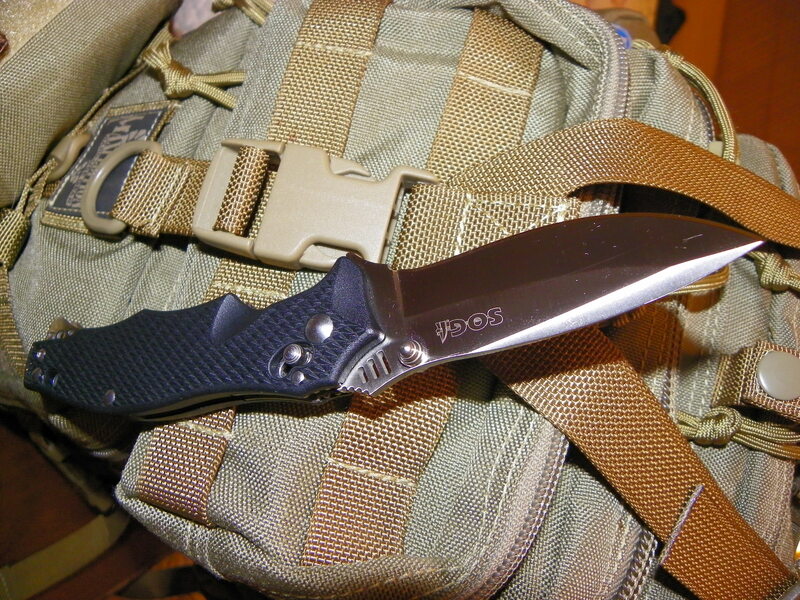 I first met SOG Knives representatives at the 2011 Atlanta Blade Knife Expo. I do not know if you would say I am a knife guy as my usual focus is on competitive shooting and tactical gear. I am, however, a practical knife guy. I do not own many folder knives, but I do carry a pocket knife every day. I am of the opinion that everyone should carry a folding knife or more specifically a tactical folder or combat fighting knife. Whatever you prefer to call this type of knife they are popular for the right reasons. They are small and compact enough for everyday carry. An added benefit to the user is that it offers exceptional utility, and with proper training and education this style of knife can make a powerful self-defense tool. So sit back and let me tell you why I believe the SOG Vulcan Mini may exceed expectations and be one of the best tactical folding knives. SOG Specialty Knives & Tools was founded in 1986 with a focus on manufacturing commemorative military inspired knives. In 2000 SOG created their patented assisted technology that made it easier and faster to open a folding knife ambidextrously. To continue with SOG’s salute to the military, the Vulcan takes its name from the General Electric M61A1 Gatling-type 6-barrel 20mm cannon which fires M50 ammunition at 6,000 rounds per minute, and is the principal cannon armament of fighters such as the F-16, F-15 and F-18. The SOG Vulcan Mini like its namesake is formidable. Constructed to be powerful, this mini folder utilizes the Arc-Lock. This is a patented locking system that can withstand over 1000 lbs of force far surpassing conventional locking systems. Why is this relevant? The locking system on a folding knife is responsible for many functions making it one the most notable attributes. A poorly designed or non-functioning locking system can ruin a knife; however, SOG may have achieved perfection with the Arc-Lock. The Arc-Lock provides lightning quick one-handed opening and closing capabilities. The spring action securely retains the blade closed and is truly ambidextrous. If the locking system is the brains of the knife providing safety and functionality, then the heart of a knife is the blade. I understand blade length is vital, but the 3” blade of the Vulcan Mini does not disappoint. Weak? No, you are holding power. The blade is a full .125” thick with a spear point shape and has the new kick deployment of the blade. Not only does this make for easy opening but it extends the tang of the blade giving you a more secure grip. How easy can you open the Vulcan Mini? Just press on the back of the blade and the knife comes out fast. No one wants to fumble around when they need the blade deployed right away, so the simpler the opening mechanism the better. Handle material is particularly important regardless of type of knife or its intended use. A non-slip material is preferable under most conditions, especially when wet. Handle slabs are available from hard to somewhat soft materials, choose the type you prefer. The Vulcan Mini has full steel liners encased in glass reinforced nylon (GRN) handles. I do not think you can find better quality for the price. I found the grip did not slip even in wet conditions. Since a pocket knife is designed for every day carry, size and weight do matter. The 3.4 oz. weight of the Vulcan Mini is impressive. Less than a 1/2 inch thick, the Vulcan Mini is only 1.24” wide and 4” long when closed and will not weigh down your pocket. I am not sacrificing blade strength or design for a smaller package. SOG has achieved engineering perfection with this knife. Another advantage of the Vulcan Mini is the pocket clip. You may want the option of carrying it in different locations and even carrying the knife tip up or down is necessary to some. The Vulcan has a strong clip that is not to stiff but sturdy and snug. It allows the knife to totally disappear into the pocket keeping it out of sight but instantly available when needed. The adage of good things come in small packages could not be truer for the Vulcan Mini. This knife is the complete package. For several years, I have carried a Benchmade knife of similar size. It is 4.75” x 1.50” folded and weights 3.78 oz. The 3.5” blade is a Hollow ground modified sheepsfoot blade with an ambidextrous functioning thumb-hole opener. How many comments did I get about this knife? Almost none. In just a few short weeks, I have become the envy of my co-workers and receive comments daily about the Vulcan Mini. I believe that function follows form. The Vulcan Mini does not have any non functional parts and is beautiful, elegant and sleek. When opened the blade has a mission and purpose. Engineered to utilize every centimeter and ounce of material, the SOG Vulcan Mini is the ultimate in tactical efficiency. Any prepared hunter, outdoorsman or tactical ninja must have at least one folding knife at his or her disposal. If you are going to choose just one – maybe it should be the SOG Vulcan Mini. 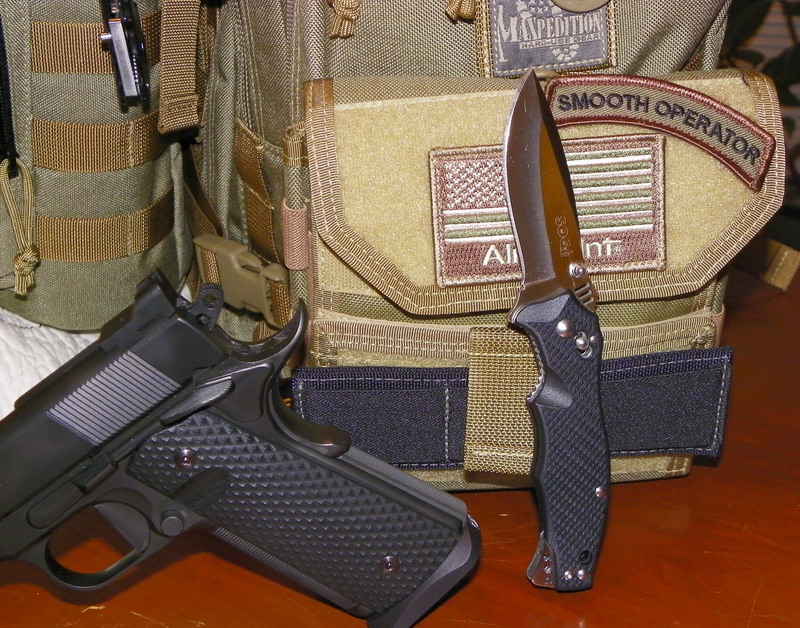 For more information about SOG Specialty Knives & Tools, please check out their website. For over twenty years this company has been producing top-quality knives and specialty tools that are now “Gunny” approved. For any questions you can email Danny at Danny@carduccitactical.com See you on the range! • VG-10 Steel which provides superior edge sharpness and retention, as well as enhanced rust resistance. You will not have to sharpen this knife as often. This stainless steel has high chromium content and many knives made from VG-10 are priced at much higher prices than the Vulcan Mini. In addition to Chromium, this steel contains vanadium which provides toughness. • Black TiNi Finish – Titanium Nitride (TiNi) is an extremely durable black finish which is best for steel blades and provides better edge retention and is less prone to scratches, peeling, rust and oxidation. • GRN Handle – Glass Reinforced Nylon (GRN) is composed of thermoplastic polyamide nylon and fiberglass making the Vulcan Mini strong, abrasion and impact resistant. GRN allows little thermal expansion, and offers chemical resistance to common chemicals, such as motor oil, transmission fluid, and methanol. • Reversible Pocket Clip – Remember snug and not too tight allowing the knife to be carried in multiple positions and be retrieved in an instant when needed by the user. • Lifetime Warranty – All SOG products are guaranteed against defects in workmanship and materials for the life of the original purchaser. This entry was posted in Knives, Product Reviews, Tactical Gear and tagged arc-lock system, Carducci Tactical, folder knives, grn handle, mini knives, Mini Vulcan, sog blades, SOG knives, sog powerlock, SOG Specialty Knives & Tools, tini finish, vg-10 steel. Bookmark the permalink.